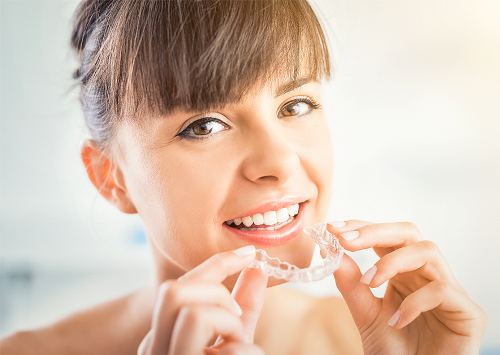 If you would like straighter teeth but don’t want to deal with the embarrassment, discomfort and time associated with traditional metal braces, Invisalign® clear braces may be your ideal option. With Invisalign, you can enjoy a straight, beautiful smile with a treatment that is painless, convenient and virtually unnoticeable. If you live in the Lake Oswego, West Linn, or Portland areas of Oregon and want to learn more about Invisalign, call Contemporary Dental Health today at 503-636-4069 to schedule an initial consultation with experienced dentist Dr. Keith Ogawa. Invisalign is a clear, plastic orthodontic treatment that can address alignment issues without the discomfort, embarrassment or disruption of metal braces. Invisalign utilizes a convenient, comfortable process to transform your smile with custom-fitted, clear plastic aligners. The clear plastic trays used during treatment are routinely switched out for new trays. The aligners are tailored to the contours of your mouth and straighten your smile gradually, in less time than traditional braces. Convenient: Enjoy all of your favorite foods and brush like you regularly do. Thanks to the ability to remove your alignment trays at any time, you can eat what you want and maintain your at-home dental hygiene routine without any added hassle. Comfortable: No wires, no brackets, no tightening appointments. Your smooth, form-fitting alignment trays are precisely made for the contours of your unique mouth. Customized: Invisalign’s clear plastic aligners are custom-fit just for you and your individual needs. Unnoticeable: One of the most exciting benefits of the Invisalign system is the fact that the smooth plastic trays are virtually invisible to other people. Thanks to Invisalign’s unnoticeable system, you can get the important care you need discreetly, without feeling embarrassed by unsightly metal wires and brackets. Fewer dental visits: Invisalign treatment requires fewer dental visits because there are no brackets or wires to tighten. The best way to determine if Invisalign is right for you is to meet personally with Dr. Ogawa in a private, confidential consultation. During your consultation, Dr. Ogawa will assess your oral condition, explain your treatment options and recommend the treatment or procedure that best matches your unique needs and goals. To find out more about the Invisalign system and your candidacy for the treatment, please contact Contemporary Dental Health today at 503-636-4069 to schedule a personal consultation with Dr. Ogawa. We help patients from Lake Oswego, West Linn and Portland, Oregon achieve the straight, beautiful smiles of their dreams.